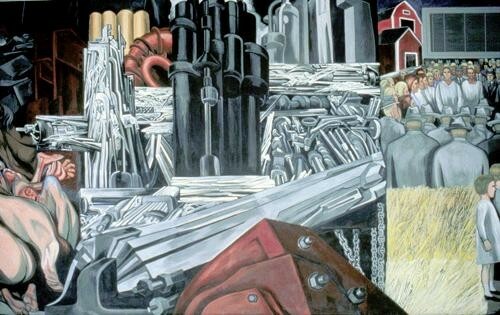 José Clemente Orozco may have wondered who besides Dartmouth College students would come to see his astonishing mural in the school's library. But the Mexican artist, a contemporary of Diego Rivera, certainly couldn't have conceived that anybody, anywhere in the world, would someday be able to do so on a magical thing called the internet — and without leaving home. Yes, Orozco is online. Dartmouth's Hood Museum of Art as created an interactive website for the National Landmark mural, titled "The Epic of American Civilization," which was commissioned by the college and painted on the walls of the Baker-Berry Library between 1932 and 1934. The fresco is considered one of the finest mural paintings in the U.S. Some of its 24 scenes — which cover 3,200 square feet — are not for the faint of heart. The history of the Americas, from the Aztecs to the rise of modern, capitalistic civilization, is often brutal, particularly in the eyes of an artist devoted to the causes of peasants and workers. Anyone from scholars of Mexican art to the greenest student just discovering the work can now access not only the mural itself but more than 200 preparatory drawings and photographs. The site permits a 360-degree scan of the Orozco Room at the viewer's own pace. If you've been meaning to go and see the mural in person, by all means do. But meantime, you can get a preview by clicking here.